I recently moved back into the Lower Peninsula, my true home, from Marquette. I have not been in the area for quite some time, I knew I had to take advantage of the five weeks I was going to be staying. I visited a few favorite spots within the first three days I was back. 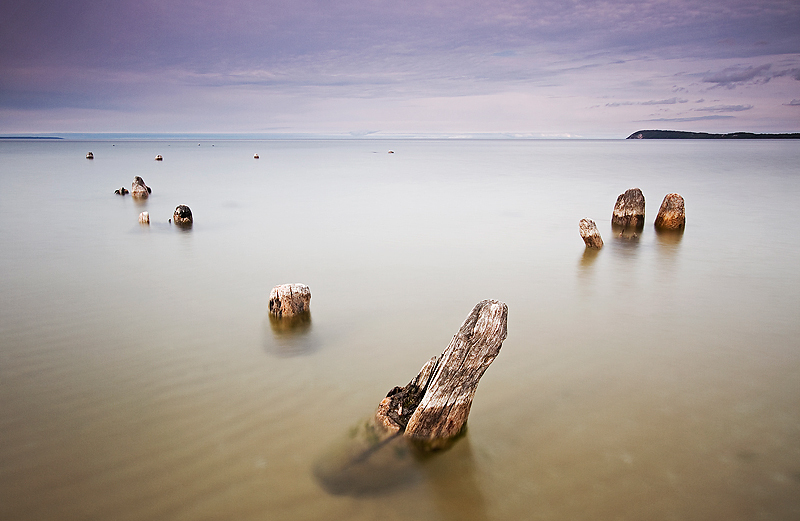 On the second day home, I decided to visit Good Harbor Beach (part of the Sleeping Bear Dunes NLS) to shoot the small pilings with the Bluff and South Manitou Island. It was around four-five O'clock, The sky was mostly covered with overcast conditions, however, the sun was barely peaking through directly behind me, making for interesting soft highlights on the small pilings. 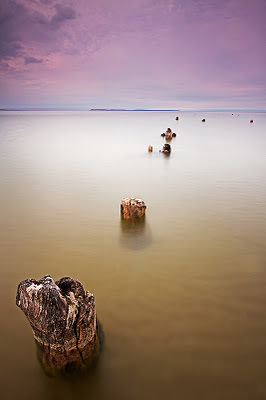 I was pleased with the overcast sky, the mood of the this photograph would not be nearly as powerful without the soft cool hues of the water and sky complimenting the waterlogged pilings soft texture. Above: Canon 7D, Canon 10-22mm lens (@15mm), 3-stop neutral density filter, 2-stop reverse graduated neutral density filter, ISO 100, F/16, 4 seconds. Below: Canon 7D, Canon 10-22mm lens (@14mm), 3-stop neutral density filter, 2-stop reverse graduated neutral density filter, ISO 100, F/16, 4 seconds.